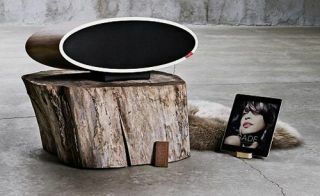 Tangent turns on the style with oval-shaped aptX Bluetooth speaker | What Hi-Fi? We're expecting to see a LOT of wireless AirPlay/Bluetooth speakers at IFA 2013 later this week, but this particular one – called the Tangent Classic – has already caught our eye. It's from Danish company Tangent and houses a bass reflex stereo speaker within a stylish, oval-shaped cabinet with a striking walnut finish. Streaming is taken care of by aptX Bluetooth, and there's a USB port for charging your iPhone or iPad. Tangent says the Classic been designed to deliver "a balanced, generous, powerful sound". Inside the cabinet are a pair of 1in tweeters and two 5in woofers, driven by a 2 x 50W (RMS) amplifier. For those who want a wired connection to the unit, there's a 3.5mm aux input as well. No details on UK pricing yet, but we'll update this story as soon as we know.